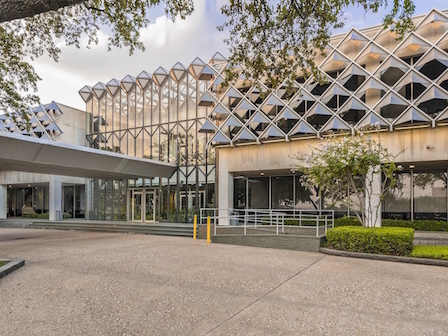 Originally home to the Great National Life Insurance Company this office building, completed in 1963, is an outstanding example of the 1960’s garden style office complexes which sprang up around Dallas. Designed by Grayson Gill, it has a unique projecting screen of diamond shaped panels giving the building a distinctive look in contrast to the very flat, clean lines of earlier 1950s office building architecture. The Salvation Army now uses it for offices, although the building is currently for sale. The expansion and growth of medical facilities near the building raises the threat that this mid-century gem could be razed for new development.